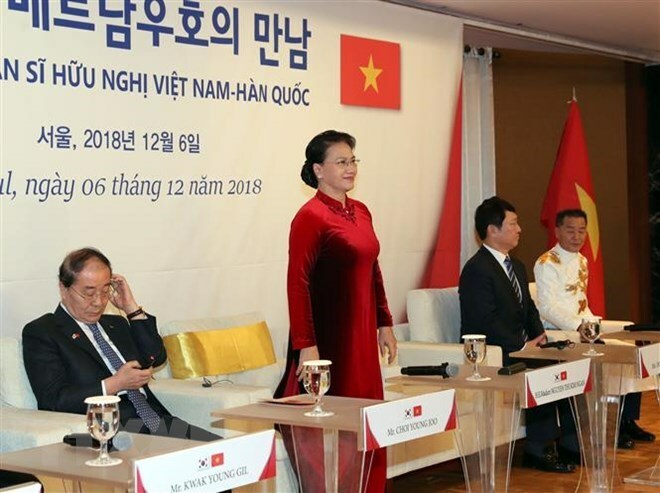 The Vietnamese top legislator made the statement during a meeting with those who have made contributions to the Vietnam-RoK friendship on December 6 in Seoul as part of her ongoing official visit to the country. Jointly held by the RoK-Vietnam Friendship Association and the Korea-Asia Friendship Foundation (KAFF), the event saw the participation of representatives from RoK enterprises, non-governmental organisations in cooperation with Vietnam, experts, scholars, and lawyers. Addressing the event, President of the RoK-Vietnam Friendship Association Choi Young-joo said that as a people friendship organisation, the association has contributed to the development of bilateral relations over the last 20 years, especially implementing programmes to support Vietnamese people living and working in the RoK. The association is also working to enhance technical and economic cooperation, culture, and people-to-people exchange between the two nations, he said. President of KAFF Choi Jae-seong highlighted the fruitful development of bilateral ties, saying that Vietnam is an important partner to his country. After the free trade agreement (FTA) between Vietnam and the RoK took effect from December 2015, two-way trade increased rapidly. After three years of implementing the FTA, Vietnam is the RoK's fourth largest trade partner, while the RoK is the biggest investor in Vietnam. Ly Thua Vinh, Chairman of the Association of the Ly Hoa Son clan, said that the Ly families [descendants of Prince Ly Long Tuong who immigrated to the RoK from Vietnam in the 13th century] always remember their roots and they feel happy to witness the increased friendship between the two countries. President of the Korea-Vietnam Culture Economic Association Kwak Young-gil stressed that friendship and cooperation between the two countries has become a model for development cooperation relations. Prof. Ahn Kyong-hwan, President of the Association of Vietnamese Studies in the RoK, said that many activities have been arranged by the association to promote Vietnam’s image in his country, with workshops and exhibitions focusing on Vietnamese culture and history. On the basis of friendship and mutual trust, the RoK and Vietnam can certainly overcome all difficulties and challenges towards a more prosperous future, he stressed. NA Chairwoman Ngan thanked RoK friends and people friendship organisations for their support and sustainable cooperation with Vietnam in accelerating the bilateral friendship. The two nations have witnessed the breakthrough development of their relations across many fields, especially after they upgraded the ties to a strategic cooperation partnership, Ngan stressed. The enhanced people-to-people exchange in particular contributes to promoting the bilateral relationship, she added. 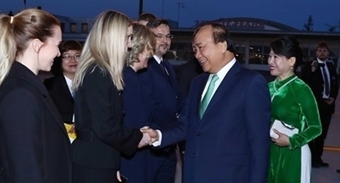 She expressed her belief that the friendship and cooperation between Vietnam and the RoK will continue to grow stronger in the future, bringing practical benefits to their people and for the prosperous development of each country towards peace, stability, cooperation, and development in the region and the world. Chairwoman Ngan briefed participants on Vietnam’s socio-economic development and international integration over the last 30 years, affirming that Vietnam has pursued its consistent foreign policy of independence, self-reliance, diversification and multilateralisation of external relations, and active international integration. She suggested people friendship organisations in Vietnam and the RoK continue their wide range of practical exchanges to further contribute to strengthening the friendship and cooperation between the two nations.